← Cone Zone season has arrived. Slow down and respect roadside workers. Congratulations Allyse MacFayden from the Ministry of Citizens’ Services (Queen’s Printer BC)! Allyse won a vehicle safety kit with a year of roadside assistance when she entered our draw at the Local Government Management Association conference in Victoria on May 17th. 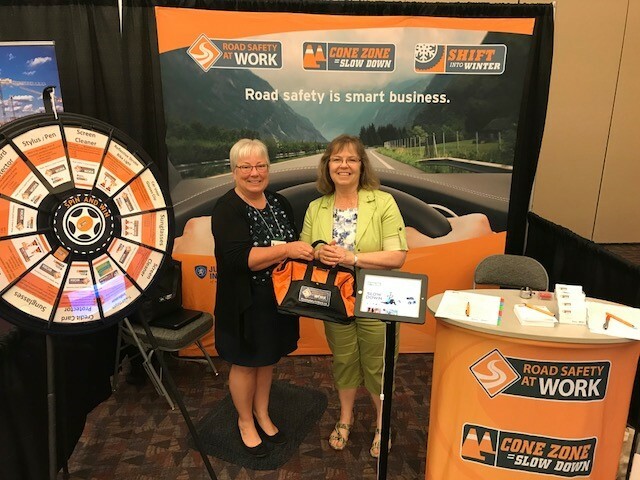 The Local Government Management Association conference was a great opportunity for Road Safety at Work to speak with representatives from municipalities all over BC. Municipal workers often experience the hazards of working along active roadways. Our Cone Zone campaign aims to draw attention to the vulnerability of roadside workers and asks drivers to “Slow Down, Pay Attention and Respect Our Roadside Workers”. Allyse was attending the conference with Wendy and Glenda. When Allyse was unavailable to pick up her vehicle safety kit, her colleagues stepped in to collect the prize on her behalf and had some fun testing their road safety knowledge with questions on our prize wheel. Although Allyse, Wendy and Glenda do not often drive for work purposes, many others in their department do. They agree that workplace safety is of upmost importance, whether you’re behind a desk or a steering wheel. The Road Safety At Work website is an excellent resource to help employers address their road safety priorities.